The Pevensey Bay Sea Defence scheme is unique. It was the first sea defence project anywhere in the world to be funded as a Public Private Partnership (PPP/PFI). In committing to a 25 year contract, Pevensey’s residents and environment are guaranteed a consistent standard of defence until at least 2025. This approach to beach maintenance has allowed the Environment Agency and Pevensey Coastal Defence Ltd to develop and advance ‘best practice’ in provision of sea defence services. Pevensey Bay’s Sea Defences consist of a naturally formed shingle bank that extends for 9km between Eastbourne and Bexhill in East Sussex on the English Channel coast. It is supported by a timber groyne field that in the late 1990s was reaching end of its useful life. A permanent breach in the shingle bank would result in a 50 square kilometre area behind the defences flooding at high tide. Over 10,000 properties, several caravan parks, important road and rail links would be affected, as would Pevensey Levels, an important ecological site that has Ramsar Convention status as a Wetland of International Importance. Responsibility for the defences rests with the Environment Agency (the Agency), a Non-Departmental Public Body of the UK government’s Department for Environment, Food and Rural Affairs (Defra). The Agency's principal aim is to protect and enhance the environment and in doing so to make a contribution towards the objective of achieving sustainable development. One of its key functions, for which it received regulatory powers, is Flood Defence. In addition the Agency has an operational role, which provides a range of permissive powers enabling it to undertake flood defence schemes where considered appropriate and justifiable from the national perspective. It is important to note that the Agency has no positive duty to provide or continue to maintain flood defences. Traditionally flood defence capital projects have been procured by using Consulting Engineers for design, Contractors for construction using civil engineering standard conditions of contract, with the Agency's ‘in house’ direct works department undertaking maintenance of completed schemes. In the case of Pevensey, maintenance is complicated by the presence of more than 300 properties built on top of the defences, the result of poor planning control in the past. As a new organisation in 1996, the Agency was keen to determine whether its expenditure was achieving best value for money. One of the first steps to this end was to review potential use of Private Finance Initiative (PFI) for procurement of some of its flood defence capital projects. PFI was launched in 1992 as UK Government policy designed to increase the involvement of the private sector in the provision of public services. Other policies with a similar aim were already in existence, namely Public Private Partnerships (PPP), privatisation and contracting out. It may be argued that PPPs offer opportunities for variance from the PFI concept but to all intents and purposes PFI and PPP projects are one and the same and the two terms are now used interchangeably. The prime objective of both is to obtain better value for money in major public procurement and to secure the provision of improved public services more quickly than would be possible under more traditional routes. Bidders are invited to provide offers for the delivery of services over an extended contract period, typically in the order of 20 to 30 years. A successful bidder is usually expected to fund the design, construction and commissioning of all assets necessary to provide the service. Once the service is available for use, the Contractor is paid an agreed periodic sum that is dependent on the level of service provided. The long term contracted cash flow offers security for the Contractor to raise the finance to fund the asset construction. Throughout the contract period the Contractor is responsible for the maintenance of the asset. The emphasis therefore is on whole life costs, revenues and risk, which is in contrast to the traditional UK contract that has focused predominantly on the creation of an asset and has given insufficient attention to performance over its economic life. The contractor, by looking at whole life costs, will be able to provide innovative methods of delivering the service thereby reducing lifetime expenditure. Contract risks will be the responsibility of the party best able to manage them. Thus the Contractor will take on some risks usually borne by the public sector. Through better management the cost of these risks will be reduced and absorbed in the overall payment system. In order for the Contractor to be able to innovate and assume risk, a project needs to comprise a suitable asset/operational split. If the vast majority of the whole life project cost is attributable to the early provision of an asset, for instance a concrete sea wall, value for money is unlikely to be achieved and the project may be little more than a hire purchase scheme. As a general rule at least 50% of the Present Value (PV) costs of a PFI/PPP project need to be made up of annual maintenance and the provision of auxiliary services. Most importantly of all, if risk transfer and opportunities for innovation are to be achieved, a PFI contract must be based on an output specification that prescribes a service and not a design specification that describes an asset. It is interesting to note that the PFI premise has now been adopted in many places around the world, including France, the Netherlands, Portugal, Ireland, Norway and Finland in Europe. This is in part because of its uptake by bodies such as the IMF, WTO and World Bank as they strive to reform their funding programmes. According to the National Audit Office, an organisation independent of UK government, PFI projects are more likely to be delivered on time and on budget than more traditional schemes. The exceptions tend to be where the public sector changes the specification part way through a contract. PFI contracts have in the main been used to deliver solid structural assets such as schools, roads, hospitals, prisons, bridges and the like. Given sound geotechnical information for the site, proven construction techniques and use of quality materials, any contractor should be confident that maintenance costs for these kinds of asset can be accurately predicted for the duration of the project. This degree of certainty does not apply in the case of a sea defence, particularly where the asset is a shingle embankment that is subject to tidal attack and is materially changed every 12 hours, of every day, of every year. This was just one of the issues that had to be addressed by what is a bespoke contract. Given Pathfinder status by the Agency for what was (and still is) the only environmental and flood defence PPP/PFI in existence, many unusual issues had to be addressed. Each shareholder has a contract with PCDL backed up by a similar direct agreement with the Agency, which would allow the Agency to continue to maintain the defences should PCDL fail to perform. A structure where the shareholders, lenders and subcontractors are the same parties reflects the fact that the Pevensey contract, with a cash value under £30 million (1999, and index linked), is small in PFI terms. The principal service is provision of protection against flooding from the sea and the prevention of breach of the shingle bank for any storm with a return period of 1 in 400 years or less. This gives rise to two further definitions; evaluation of individual storms and a beach able to withstand a 1:400 year event. Storms are defined by a combination of predicted astronomical tide and the storm surge, significant wave height and wave direction that occurs coincident with each high water. It was accepted that locally measuring wind, wave and water levels during storm conditions throughout the 25 year period was impractical, so water data comes from Admiralty Tide Tables and the Proudman Oceanographic Laboratory (POL) surge model, with wave information taken from the Meteorological Office (UKMO) wave model. Joint probability curves were derived from comprehensive analysis of storms from the previous ten years, and these cover events from 1 to 400 years. Because of the length of the contract, there is provision to allow for review of these parameters, potentially adjusting for changes in sea level, isostatic tilt and increased storminess – hence the need to quantify all storms of greater than 1:1 year probability. As with any contract between two parties involving the exchange of money for goods or services, an agreed system of measurement is essential for financial and quality control. The success and smooth running of any contract is invariably dependent on the clarity and ease of application of the monitoring and measurement system. 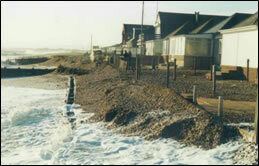 Applying the PFI concept to a sea defence scheme such as Pevensey poses particular challenges in this respect. Unlike any other similar contract to date, the service requirement is that something, namely flooding, should not happen. For more than 99% of the 25 years, protection service levels against storm events will not be tested and there will be no output to measure. Indeed in the case of the higher service levels they will probably never be tested. Consequently it was necessary to show some physical evidence of service provision throughout the contract period. The chosen method was to agree certain key physical features of the sea defences, with monthly service payments then dependant on them being in place within certain tolerances. Incorporated within the contract therefore is the right for the Agency to carry out inspections and surveys of the beach to ensure the key physical features are in place. A progressive points and financial deduction system encourages the Contractor to maintain the key physical features at all times. The key physical features are essentially two million cubic metres of shingle distributed over nine kilometres. It moves around under wave action to the extent that its shape can alter rapidly in a few hours. The Agency has used aerial surveys to annually monitor the beach since 1973, which allowed for long term trends to be identified. Advances in GPS technology during the 1990s meant that undertaking real-time beach surveys with a vertical accuracy of 25mm became commercially viable. The speed and accuracy afforded by GPS results in beach volumes being known to between ±5,000 - 10,000 cubic metes – less than half of one per cent of the total volume. With a 1:400 storm defined, a beach capable of withstanding such an event had to be defined. Put simply, a minimum width for the shingle embankment was agreed, assuming typical rear and front slopes of the beach were maintained. This included an allowance for day to day recession, so that in lesser events the Contractor has sufficient time to restore the defences and allow some natural recovery to occur. It is interesting to note that PCDL now monitors the beach far more than the client. A GPS receiver has been mounted on to a quad bike, which enables the 9km of foreshore to be surveyed far more quickly than on foot. Consequently a survey has been completed every month for the last six years. This not only confirms the Contractor’s compliance with the contract, but also identifies any areas where work is required and provides invaluable data that will help identify continuing long term trends as well as help refine maintenance techniques. Pevensey is now the most monitored beach in the UK. Performance of the scheme's design to agreed weather standards. Placing of an acceptable Environmental Statement and the obtaining of all statutory approvals. Reinstatement costs for the permanent loss of shingle as the result of a weather event with a return period between 1 in 50 and 1 in 400 years. It is also worth highlighting that a PFI contract such as this positively encourages innovation and examples of innovative ideas that have been applied will be discussed later. In recognising that future design changes and therefore reductions in cost could occur, the contract allows that any savings of this nature are to be shared equally between the Agency (and therefore the public purse) and PCDL. The success of any project depends, of course, on effective management. A complex set of relationships exists between PCDL, its shareholders, the Agency, other Government departments, local authorities and interest groups and, importantly, the local residents at Pevensey. Unusually the project area is not owned by the client and indeed most of the crest-top properties on the defences own the land down to mean high water. Work is legitimately undertaken using the Agency’s permissive powers, but the sensitivities of residents and other land owners cannot be ignored. PCDL has an ‘open door’ policy at their local office and actively encourages residents to visit. By learning of what is being done and why, local communities gain a greater understanding of what is needed to maintain a sea defence and that a degree of intrusive work will always be necessary. At the same time both PCDL and the Agency have recognised that the use of large and noisy items of plant on the beach should be minimised. This last point is particularly pertinent. All coastlines are perpetually evolving and the ‘soft’ shingle beaches of the English Channel change remarkably quickly at times. Trying to adequately define something this ephemeral in a contract document is very difficult. All involved believe that the existing documents are workable and fair to both parties. To date both Agency and PCDL project managers have taken a pragmatic view and manage the beach day to day on a commonsense basis, using the Contract only when necessary. It is unusual for there to be more than one or two items of contractual correspondence every year. It is clear that the relationship between project managers could on its own make or break the Contract, and to keep it close, cooperative and effective for a full 25 years will be a major challenge. Relationships that exist between PCDL and its shareholders also required careful consideration. As well as being shareholders, the participating companies are also sub-contractors, each providing different services. It may be that in certain circumstances a company’s interests as a sub-contractor and as a shareholder may conflict. In order to avoid such a situation it is vital that all decisions are made in the interest of the shareholders alone. Clearly this requires self-discipline but, more importantly, an ability to work openly, constructively and honestly together. This was an important consideration when selecting the team in the first place. During the negotiation process, which was at times quite difficult, the cohesion of the group was tested and proved to be a real asset. The service required of PCDL is the improvement and maintenance of a shingle embankment. 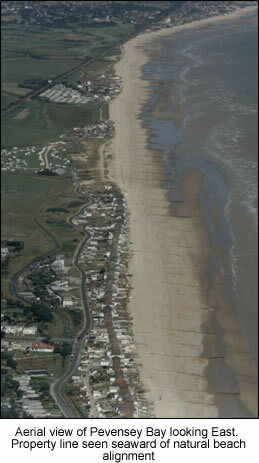 Historically the Agency has used timber groynes to help stabilise the defences and reduce losses through littoral drift. In June 2000, PCDL inherited a foreshore with 150 groynes in place, most of which were at the end of their useful life due to many years of under investment by successive governments. Replacing them either with new timber or rock ‘T’ head structures would have significantly added to project costs. Similarly, growing environmental awareness resulted in a movement towards working with natural processes rather than fighting against them. Consequently the overriding strategy became one of maintaining shingle supply and managing it as it driven west to east by prevailing wave action. Expenditure on beach structures only provides benefit in relatively small areas. Concentrating on aggregate supply and allowing much of it to move due to coastal processes means that downdrift beaches benefit too. Expanding this policy so as to manage a coastal process unit as a single entity rather than a series of disjointed Unitary Authorities would undoubtedly result in further savings for the UK taxpayer. Lack of planning control has over the years led to inappropriate development in many places, so much so that it is now impractical to do away with all groynes and manage Pevensey Bay as an open beach. Several discontinuities in beach alignment have to be maintained, but this can be achieved by maintaining about six of the original timber groynes. As mechanised plant continues to grow in both size and efficiency, it is now far easier and more cost effective to move shingle along the foreshore than it was in the past. A variety of methods are used to maintain the frontage. Given that the embankment has to be kept within certain width parameters, bulldozers are used throughout the winter to reprofile the upper foreshore and move sediments back up the beach after they have been drawn down during a storm. Excessive beach movement requires the use of large dump trucks, loaded from areas of temporary accretion, they then deposit beach in depleted sectors. The construction of Sovereign Harbour Marina on the eastern edge of Eastbourne means that now shingle washed on to its western harbour arm and has to be mechanically bypassed round to the downdrift side. Most importantly, there also needs to be an annual maintenance recharge of sea dredged aggregate. Details of all maintenance procedures can be found in the Works section of this site. In the same way the contract had to address the issue of “Paying for something not to happen”, PCDL had to consider how their involvement would be perceived by local communities, who after all are really the end client. It would be entirely possible that Sussex would not flood regardless of PCDL’s actions. It was decided that involving local residents and interest groups at all stages of the project was not only key, but could also be considered to be part of the service requirement. This process was started by the Agency with the formation of a Key Stakeholder group way back in the mid 1990s. The start of the contract saw PCDL continue and develop this liaison, particularly with residents most directly affected by the works. There is now a regular full and frank exchange of views between PCDL and a whole range of stakeholders – from individual residents through to national organisations such as Natural England. By giving people the opportunity to learn about the works when it suits them, and encouraging continued dialogue, there is a growing understanding and acceptance of what is involved in providing the flood defence service. As sea levels continue to rise – either through natural processes or as a result of human activity – management intervention in our coastal areas will continue to increase. In time there will inevitably be locations where maintaining the present shoreline proves unsustainable. Although strategy decisions will remain political, it will only be through dialogue between managers and local stakeholders that compromise operational decisions can be made. The importance of a 25 year agreement cannot be understated. In 2000, Pevensey homeowners knew that they would be protected until at least 2025, something no other area in the UK could boast. Involvement of insurance companies will play a significant role in future strategies. Generally insurers are happy to provide cover as long as the level of protection is greater than 1:75 years. In the event of future claims, companies will want evidence that the stated level of defence was indeed provided. In doing so coastal managers will need to know the severity of the weather event that precipitated the problems and that defences were in suitable condition beforehand. In turn this will mean that funds are made available to undertake beach maintenance when required rather than just when budget remains. Long term contracts such as Pevensey ensure that whole life costs are considered as a matter of course rather than a longed-for luxury. Whilst the UK may not have a long list of coastal projects suitable for future PFI schemes, many of the lessons learnt at Pevensey can be applied equally to extended period maintenance contracts. If these were established on the basis of sediment cells rather than political boundaries, then a more unified strategy would result. Recent changes mean that the Environment Agency has now taken an overseeing role of coastal issues. It is now entirely possible that a single organisation could have responsibility for a sediment cell, introducing economies of scale as the norm. For instance, small annual replenishments are more effective than larger less frequent ones. Smaller contracts are generally less attractive because of relatively high mobilisation costs. By linking several small shingle deliveries on different frontages via a single contract, far lower unit rates will be achieved. Similarly, using a single gang to recycle multiple areas in sequence will result in favourable plant hire rates. All involved in the Pevensey PFI scheme agree it has been successful, and a series of national awards stand testament to the fact that it has been a team effort throughout. However, it is equally important that lessons learnt are taken forward and used to derive a more unified approach to future coastal management.